recommended for: Fans of Stephen King (especially his more psychological stuff) or Chuck Palahniuk. People looking for a well-written thriller. Anyone interested in psychology. Cassandra Connelly looks like a normal twenty-four-year-old girl. She seems sweet and shy. She works hard in two jobs and still finds time to do volunteer work. Nonetheless, there's something wrong within her. She has a lot of anger boiling inside, and a very problematic past, making her a dark, twisted woman. I'm very picky about my short stories, but I really, really liked this. It's such a clever concept. Girl goes to therapy...because she wants to kill someone, and she wants her therapist to help her decide whether to do it. I mean, come on? Aren't you already curious!? I think part of the reason I liked it so much was that Barcelos legitimately did her homework. I thought, well, this would never work. As soon as she names a person, her therapist will have to tell the police. But she even mentioned that loophole in the text and how Cassandra got around it. I had a moment of sheer joyful geekery. The writing was clean, though a little bit exaggerated. It's an all-dialogue story, which is neat, but some of the phrasing felt a little over-the-top. I also felt that "meanness" just wasn't impactful enough for the concept Barcelos wanted to get across. But overall, it kept me up turning page after page and I'm about to go buy Barcelos' other story because I want more! It's divided into therapy sessions, which is great. Barcelos has a good concept of pacing. Cassandra slips a lot of details in the first session, but you realize in the next and next that there is still so much more to the story. I wish she had been a little more vague about the situation with her mother at first, since she re-explains it in much more detail (and more powerfully) later. However, it was definitely paced right to build suspense. I had to stop myself from reading the end first. (Also, there are people screaming in the apartment over from mine. Just thought you should know. Gr.) Also, I guessed the ending about halfway through but that's not a bad thing. It was more like, "Oh, I hope this is the ending because that would be really cool!" And it was. And it was really cool. And still managed to surprise me. So great! Serial killers and such go to therapy all the time in books and movies. But this is a whole different take on it. Like a non-humorous version of Gross Pointe Blank. Which you should watch. Now. Anyhoo, the story is also entirely Cassandra's dialogue, which is also really clever. You know that the therapist says things because sometimes Cassandra responds to them, but you're only getting words. It's like listening to a transcript and trying to piece together what happened. It lets your imagination run wild and gives it a very interview-like feel. Weirdly enough, the therapist doesn't speak in the whole book. We know her through Cassandra's statements about her, which is a really clever idea. She/he's like this ghost in the room, someone who is so important but invisible to us. Like the wife in some old play I can't think of, sadly, who is very important but never appears. Maybe she murdered someone? (If you know what I'm referring to, please comment because now it's driving me crazy.) It lets your imagination run wild. On the other hand, we get to know Cassandra very well through her statements, but we have no visual cues to tell how truthful she's being. What tone. Yet, we come to know her very deeply. Like I mentioned, a little over-the-top sometimes. Cassandra sometimes waxes stereotypical southern and I just thought, No one talks like this. But if that were toned down, what's left gives her plenty of personality. And Barcelos has a gift for description. I could imagine the scenes perfectly even without visual cues. I will say that I thought "mean" was a little too, I dunno, schoolyard bully for this book. Feeling murderous is beyond mean. I would have felt more power if it had a different name or nickname. Very nicely formatted. I liked the breaks into different sessions and there weren't any noticeable typos or mistakes, which is always nice to see in an indie work. A unique tale of a girl's struggle with her murderous desires and a fatal question--to kill or not? 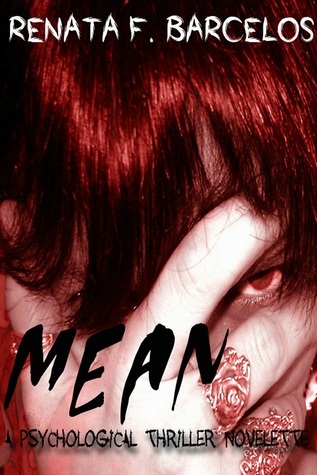 I definitely agree with your review on Mean. It gets extra points for the unconventional narrative.